When it comes to braided fishing lines, Power Pro offers a selection of quality products. None go better around the reel of an angler that casts all day than Super 8 Slick. Repetitive casting of heavy iron takes its toll on both the rod and the thumb, especially using rough braided line. An eight strand weave makes the line round and slick as butter through the rod guides. Want extra casting distance? 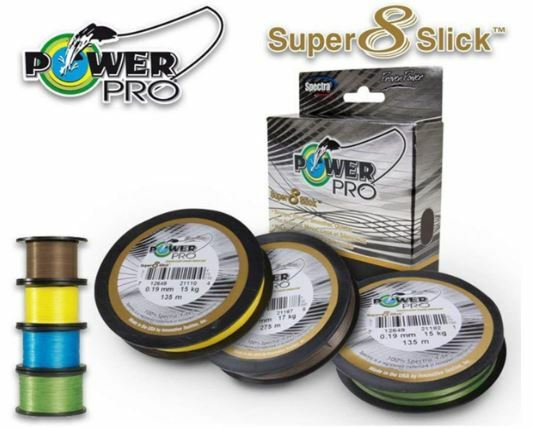 Consider spooling up with Power Pro Super 8 Slick. 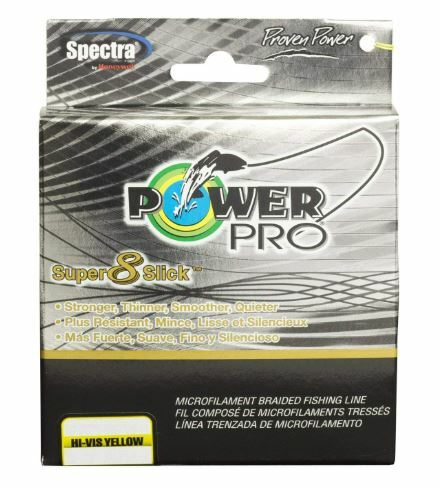 Product: Power Pro Super 8 Slick braided fishing line. Owner / Company: Shimano, Inc.
It’s a combination of elements that makes Power Pro Super 8 Slick so soft and smooth. First, there is the 8 strand weave which results in a rounder pattern than any 4 carrier braid could match. Next is the EBT process. Enhanced Body Technology (EBT) impregnates the spectra fibers with a resin, making them soft and smooth to the touch. Power Pro Super 8 Slick offers anglers a braided line that’s better for casting and easier on your gear. Available in 4 colors and 8 different tests, take a closer look at all the Super 8 Slick has to offer. All Tests & Lengths Come In The Four Colors: Hi-Vis Yellow, Marine Blue, Aqua Green, or Timber Brown. 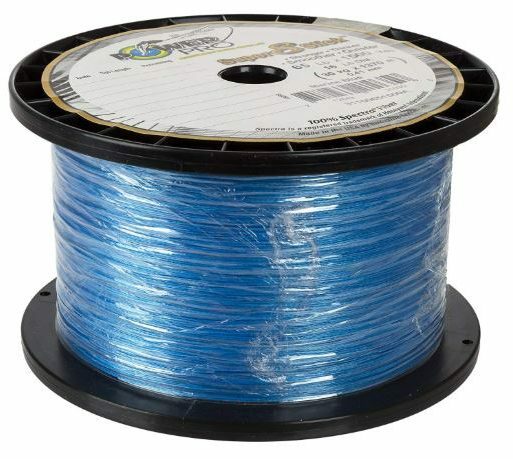 The base fiber for each strand that makes up Power Pro line is Spectra. Honeywell is the sole provider of this near zero stretch material. You’ll find Spectra fiber in a number of different applications, and Power Pro takes full advantage of its properties as well. A Braiding Machine Uses Carriers That Hold Each Strand Before Weaving. When manufacturing braided fishing line, carrier count determines the number of strands in the weave. 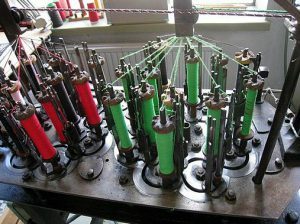 On a Horn Gear Braider, each carrier holds a spool. If the machine runs with only four carriers, it produces a 4 strand braid. Power Pro Super 8 Slick sets the machine to eight carriers, but not only that. Spools on the carriers are set with a high amount of tension before the braiding process begins. The result is a much rounder braid. Power Pro uses this proprietary process which treats the Spectra fiber with a type of resin. They call it EBT for Enhanced Body Technology. EBT isn’t like paint or coating over the line but rather gets into the fibers themselves. It makes the line softer and smoother while adding body to it as well. To say that EBT gives the line memory is going too far, but it’s easier to work with than limp braid. Round, soft, and smooth are the spotlight terms that best describe the benefits of Power Pro Super 8 Slick. These characteristics help add distance to your cast. They also decrease the toll that friction takes on your body and gear. Super 8 Slick is easy on your spool, rod guides, and your thumb. Eight strand braids have a measure of durability over those using four. They hold up better while fighting fish when knicks and abrasions occur. Super 8 Slick is near silent while casting, making it perfect when stealth is a requirement. It’s also nice to see some alternate color choices in the Marine Blue, Aqua Green, and Timber Brown. Price, availability of line size, and color options are the main drawbacks of Power Pro Super 8 Slick. Anglers have no size choices under 10 LB test or over 80. The option for different colors is great, but why not keep the Moss Green and White braid too? Super 8 Slick has value to anglers that spend weeks out of year casting offshore, but it is pricey! Anglers that swear by Power Pro braided fishing line may prefer the color options of the Super 8 Slick. More than likely. however, they use it due to the way it flies off the reel. Super 8 Slick passes near frictionless through rod guides before launching from the tip. It won’t abraid your thumb as you control your spool, at least not until the end of the day. If you’re always on the bow casting iron, Super 8 Slick will do you justice. When sound is an issue for spooky fish, use it to stay silent. Anglers may request a warranty by filling out the proper form on the Power Pro website. Note that it’s a downloadable form that you must print, fill out, and mail in. Requests aren’t valid for purchases through 3rd party vendors. Anglers can also call Shimano direct during regular business hours or send an email message. This info is all available on the Power Pro Contact Us page. High asking price is the main factor that keeps Super 8 Slick from scoring in the mid 90’s. Anglers that do make the splurge find the advantages pay off, as is so often the case with the purchase of a superior product. Reports of a waxy smooth line and longer silent casts abound from fishermen that try it. What are your thoughts or experiences with Power Pro Super 8 Slick? Let us know in the comments below!